Bailly Homestead is a National Historic Landmark that is managed by the United States Department of Interior's National Park Service. Located approximately two miles inland from the Lake Michigan shoreline and about half way between Gary and Michigan City in Westchester Township, the landmark was the home Joseph Bailly. Bailly was an independent fur trader who, at the age of 48, took up permanent residence in what would later become Porter County. Thus, Bailly and his family became the first Euro-Americans to permanently reside in the county. The Bailly Homestead also embraces the Bailly Cemetery, located in the northeast quarter of Section 27 (Township 37 North, Range 6 West). This cemetery is quite unique in its historical development relative to any other burial grounds located in Porter County. Many visitors to this historic site likely believe that it has changed little since Joseph Bailly first used the location to bury his son Robert. However, if Joseph Bailly were to view the cemetery today, it would not appear at all like it did when he resided at the homestead. There have been three distinct phases the evolution of the Bailly Cemetery. To understand each phase, we have to examine the contextual history that led to changes in the cemetery's physical appearance. Joseph Aubert de Gaspé Bailly was born April 7, 1774 in St. Anne, de Varennes, New France, now part of Québec, Canada, the son of Michel de Messein Bailly and Genevieve de Gaspé Aubert. By the age of 22, Joseph was involved in the fur trade at Michilimackinac (Mackinac Island, Michigan). Within a few years, Joseph had developed and extensive fur trading network that included trading posts at Kankakee, Kankakee County, Illinois, Wabash, Wabash County, Indiana, and St. Joseph, Berrien County, Michigan. At these posts Bailly would operate similar to a merchant wholesaler, aggregating furs from both French fur trappers and Native Americans, processing them further, and then packing and shipping the processed furs to Detroit. Ultimately, the furs were shipped to Europe. Yet his [Joseph Bailly] sorrows had been many and great, for in the days of his early Western experience he had met a very fascinating girl of mingled Indian and Eurasian blood, born of civilized parentage, whom he had made his wife according to common-law usage ere he discovered that, true to her Eurasian descent, she was a secret votary [devoted follower] of the Spirit of Darkness. Patient endeavor for her conversion, earning expostulation with her on account of her persistent adherence to the rites of that fearful cult, proving of no avail, he had long since put her aside, caring for the children born during their union as best he could. He had put her aside, not choosing to bear the yoke with an unbeliever, even as the early Church established the rule against obstinate pagans in the days of St. Paul. Bailly then wed Marie LaFevre de la Vigne in 1810, the daughter of a Michigan fur trader and, similar to his first wife, a Native American woman of the Ottawa tribe. Marie, with one child from a previous marriage, bore Joseph five children. By marrying women of Native American descent, Joseph held an advantage over other fur traders in that he could more easily and readily trade with the various tribes of the region. Strategically, Bailly established his homestead and trading post in 1822 near the junction of several Native American trails traversing along the southern boundary of Lake Michigan. Due to its location, the homestead quickly became a noted meeting place for travelers, including Native Americans. There are numerous early traveler accounts where the homestead is mentioned, several of these noting the presence of Native Americans at the trading post. Approximately three-fourths of a mile north-northeast of the homestead is a ridge of sand dunes that early settlers of the area referred to as Indian Ridge. U.S. Route 12 closely follows the ridge in this area. The ridge generally rises approximately 50 to 60 feet higher than the surrounding moist and marshy land, making it ideal for a burial ground. Indeed, according to contemporary accounts, on a slightly higher dune along the ridge was a Native American cemetery. That dune is where Bailly Cemetery is now located. Note that though several skeletons have been uncovered at the cemetery site on numerous occasions, they have always been reburied without a determination of their race. Hence, despite the strong evidence against the contrary, it has not been conclusively determined whether the Bailly Cemetery was originally a Native American burial ground. It was at this Native American burial site that Joseph Bailly buried his son, Robert "Napoleon" Bailly, in September of 1827. Robert was attending school at the Carey Mission in Niles, Berrien County, Michigan, when he died after contracting typhoid fever. The school at Carey Mission was established in 1822 by Baptist missionary Isaac McCoy and was named after noted Baptist missionary, William Carey. Joseph brought Robert's body home to be buried near the homestead. Therefore, the Native American burial site north of Bailly's homestead became the site of the first known burial of a white man in Porter County. The 1940 historical fiction novel Wolves Against the Moon by Julia Cooley Altrocchi inaccurately dramatizes Robert Bailly's death; Altrocchi suggests that Robert was stabbed to death by a sword wielded by his sister, Lucille. He [Joseph Bailly] had chosen a spot for a cemetery on a sandy knoll, about three-quarters of a mile from the house. There he had buried his son and had raised a huge cross of oaken beams as a landmark. In front of the cross he erected a little log building, where the only opening was a rather wide door, facing the cross. This building was not a chapel, but merely a shelter for those who went to pray at the foot of the cross, as did all the household on Sundays and Holy Days. There was no appointed hour for this visit, neither was there any public prayer. The rile was that the visit should be made in the morning, and each one prayed silently, according to the bent of personal devotion. An oak cross has remained standing at this burial site for nearly 200 years. Frances Rose Howe also relates a story of the death of an infant of Joseph and Marie Bailly in her book. In 1814, while Joseph was imprisoned at Detroit for being a traitor to the United States government, John Baptiste Clutier, Joseph's valet, transported Joseph's wife Marie by canoe to Mackinac (Michigan) from Menominee (Wisconsin) to reunite her with her children and other family members. Also traveling with John and Marie was Marie's very ill infant daughter. While at Mackinac, Marie also became quite ill. While she was sick, the Bailly infant passed away. The local Native Americans buried the infant in a birch bark casket under a "...beautiful forest tree, where it lay for many a year ere its parents knew that it had been thus baptized and buried. Grandmother [Marie (LaFevre) Bailly] could not be told that her infant had died, so another infant was placed in her arms, and she never knew the difference until fifteen years had come and gone." About this time, or a year or two later, Grandfather learned that the sickly child, who had been the object of so much solicitude, and who was to be the cause of great sorrow, was not his child. He was told the true story of the birth, the death and burial of the infant born after the hardships of Grandmother's weary flight. Guided by the Indians who had buried the child, he sought its grave, but the ax of the white settler had felled that edge of the forest, and it was with great difficulty that the Indians identified the stump of the tree under which they had buried the babe. A search for the remains resulted in finding a few fragments of a birch-bark basket, a few tiny bones, and earth colored by essence of the human body. Sadly and reverently Grandfather gathered these precious relics, bringing them home to be laid beside his other child. This is the true history of the origin of our homestead cemetery -- "A sorrow's crown of sorrow," reaching up to the happier things beyond the grave. At this time, also, Grandfather sought legal advice regarding the child substituted for his, but found that the testimony was insufficient to warrant a repudiation, especially after the long lapse of time since the event. He concluded to accept the situation, and consider it as a matter of almsgiving. He told his family all the circumstances and requested them never to mention the subject outside the family, and never to speak of it among themselves without absolute necessity. As years went on the girl developed traits of character, which led her to cause dissension and sow discord in the home that sheltered her. Is is not my purpose, however, to dwell at any length upon her misconduct, neither now or later on, when I shall be compelled to allude to it in connection with its consequences. Given the narrative, it appears that the second burial of a white in Porter County took place soon after Robert Bailly's burial -- the disinterment of the infant daughter at Mackinac and her reinterment at the homestead's cemetery. People of Baileytown, seeing Indians at the Homestead, referred to the whole group as "The Indians," just as the Baillys spoke of them as "The Swedes." The Finlanders were another group. It was not in the spirit of name-calling, just as convenience. The townspeople called the cemetery of the Baillys "the Indian Cemetery" because it belonged to the so-called "Indian" group. It was the only name many people knew, but it greatly incensed Miss Howe, so much so, she considered it a "slander really punishable by law." I write these lines to inform you that I am not an Indian, neither was my mother an Indian. Such statements are lies, and you will be kind enough not to tell any lies about either my mother or myself. We are aristocracy, much higher in social conditions than yourself or any one else around here. My mother's family was French and noble, my father was a New England gentleman likewise of a very noble family. My mother's parents did missionary work here, and my grandmother used to dress something like a nun, her dress of the religious missionary society to which she together with many other French ladies belonged. It is true that about two hundred years ago some one of the family did marry an Indian, but that is very long ago, and people of good sense and education do not speak of our family in the way, my adopted daughter tells me you [Henry Friday] did. You a not my social equal, and you have no business to pretend that you know anything about a family so far above your own. It is suspected that this and other letters by Miss Howe resulted in considerable damage to the Bailly and Howe legacy in the northern section of Porter County, as local newspapers were still referring to the animosity between the Bailly's and old settlers in the area more than 50 years after the publication of Frances' letter above. Joseph Bailly's granddaughter, Frances R. Howe, claimed the first interment occurred in 1827 when Bailly buried his ten-year-old son Robert. However, it is very doubtful that this boy was the first white entombed there. Just outside the present cemetery wall on the north are tombstones containing eight names. Four of these markers have dates preceding 1827, the year Robert Bailly died. These include: Isaac Schellinger, 1811; Peter Carlbon, 1814; Rhoda Schellinger, 1816; and Thomas B. Speer, 1817. 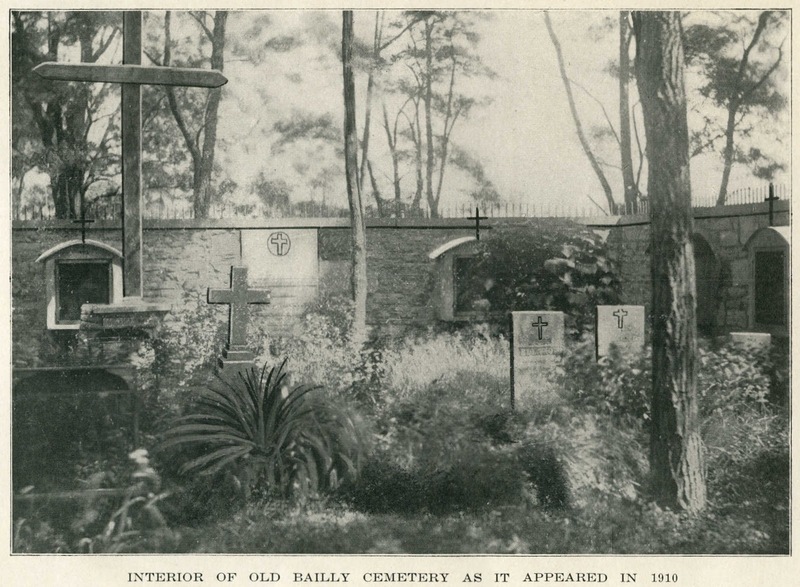 It is not inconceivable that Euro-Americans were buried in the Bailly Cemetery prior to its use by Joseph Bailly. As previously mentioned, Bailly established his homestead near the junction of several well traveled Native American trails. These trails were also utilized by whites traversing through the region prior to Joseph Bailly's permanent settlement in the area, especially as they ventured westward from Detroit. It makes reasonable sense that if a white person died between present day Gary and Michigan City, or perhaps beyond, that they would have been interred at a location already being used as a burial ground by Native Americans. The Native Americans in the area at the time prior to Joseph Bailly's settlement, the Pottawatomie, were noted as being generally friendly with the whites passing through their territory and may have allowed burials of Euro-Americans within their burial ground. After Robert "Napoleon" Bailly's burial in 1827, the site essentially became a family graveyard, although burials of individuals unrelated to the Bailly's were numerous. For instance, it is known that several Swedish residents of the area are buried in the cemetery in unmarked graves. In March of 1864, Rosene Marie Victoire (Bailly) Howe, commonly referred to as Rose Howe, acquired title to her father Joseph Bailly's property, which included the cemetery land. Soon afterward, in 1866, Rose Howe enclosed the cemetery area with a wooden fence. She also specifically requested that her neighbors, being mostly Swedish immigrants, to discontinue using the cemetery for burials and to remove their dead relatives and bury them elsewhere. Few neighbors apparently complied with Rose's request. In fact, during Rose (Bailly) Howe's absence on an extended trip with her daughters to Europe and the Holy Land between 1869 to 1874, at least three Swedish immigrants are known to have been interred in the Bailly Cemetery. As mentioned previously, most locals referred to the graveyard as the Indian Cemetery and did not necessarily associate it with belonging solely to the Bailly family. When Rose's unmarried daughter, also named Rose, was buried in the cemetery in April 1879, she became increasingly anxious about the privacy at the cemetery. Namely, she wished the cemetery to be used only as a family burying ground. Reportedly distressed by the fact that her neighbors did not comply with her previous requests concerning burials and disinterments at the cemetery, Rose (Bailly) Howe had a six-foot limestone wall constructed on the site in 1885, topped with iron spikes. The inside of the wall included stations of the cross placed inside wooden cabinets mounted into the limestone, as well as an altar at the southeast corner. the Cross are visible along the wall. Source: John O. Bowers' The Old Bailly Homestead, 1922. Only Bailly family members were interred inside the limestone wall. Individuals not of the Bailly family were left outside the walls or disinterred and placed outside the wall. It is suspected a few individuals were disinterred and moved to nearby cemeteries, such as Augsburg Cemetery and Burstrom Cemetery. 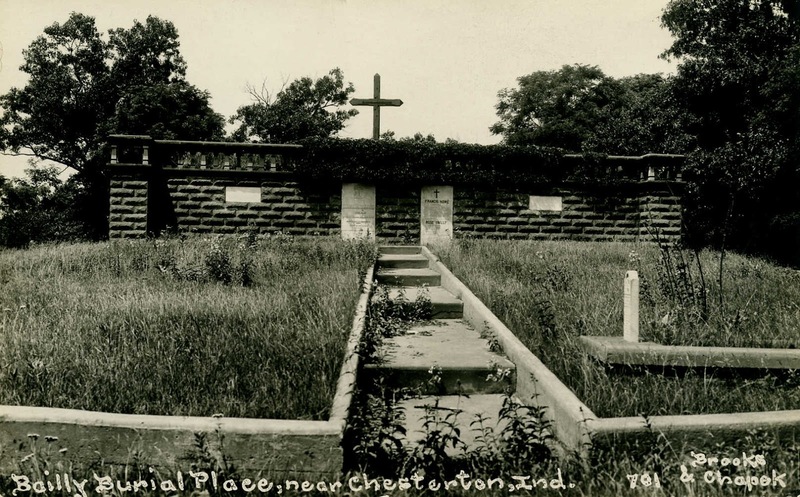 In 1914, Frances Rose Howe, daughter of Rose and granddaughter of Joseph, hired Theodore Stephens of nearby Chesterton to erect a concrete wall following the 1867 fence to control entry into the cemetery. The local newspaper contained an article whereby Frances indicated that she was troubled by the fact that the cemetery was becoming somewhat of a historical tourist attraction. The introduction of the automobile, the considerable improvement of the Old Chicago Road (also referred to as Dunes Highway and U.S. Route 12), and the proximity of the cemetery to the highway likely had a substantial impact on increasing the awareness of the historical significance of the cemetery and the homestead. Theodore Stephens erected stairs on the north side of the cemetery and an ornamental railing was installed on the top of original 1885 limestone wall. The plaques installed in 1885 were moved from inside the wall to the outside of the wall, and the interior of the enclosed wall area was filled with sand. During the 1914 renovations and construction, numerous graves were uncovered and reportedly moved just outside of the new construction in unmarked graves. Thus, visitors walking around the perimeter of the walled structure of Bailly Cemetery today are likely treading over the remains of those not of Bailly ancestry. was filled with sand. Note small white tombstone at right of walkway. reportedly the tombstone over the burial site of "Ida Peterson's brother." In 1921, Carl and Antonia (Zohner) Danielson purchased the land embracing the cemetery ground from James L. and Emma C. (Bachmann) Huston. Emma was adopted by Frances Rose Howe on September 26, 1904, in Porter County, and she had inherited the property when Frances passed away in 1917. The Danielson's [Sic] have taken it upon themselves to take possession of the plot, using it as a pasture for their cattle and ordered many people from visiting this historic spot. No one was allowed on the grounds at any time by them. Even close friends who wished to place flowers on the graves of Miss Howe and others were ordered away by the Danielsons. A civil suit was filed by 24 individuals living near the cemetery in the Porter Circuit Court on August 15, 1927, seeking to restrain the Danielsons from interfering with the public's access to the cemetery grounds. When the suit was filed, Judge Grant Crumpacker issued a temporary restraining order against the Danielsons and set a hearing date for the following week (Monday, August 22); the Danielsons were compelled to allow visitors to the cemetery. It was brought out at the hearing that the persons claimed to be buried in the cemetery are really interred on the outside of the stone wall surrounding the historic grave yard.... The court's ruling was on the theory that the Danielson's [Sic] were innocent purchasers and had no knowledge that the cemetery existed outside the stone wall. Cattle may be permitted to graze unmolested over historic Baillytown cemetery, overlooking Dunes Highway, save where a deed protects the small stone surrounded burial plot of Joseph Bailly, Porter county's first white resident and members of his family. Thursday in Porter circuit court, Judge Grant Crumpacker dismissed the injunction case brought by a number of residents in north Porter county represented by Attorney James J. McGarvey, when the plaintiffs did not appear to fight the desecration of the cemetery which linked the county with pioneer days of the state. Some time ago Judge Crumpacker dismissed a temporary restraining order granted without notice and refused a temporary injunction because the cemetery, established in 1832, was not registered and because the deed to the land purchased by Carl and Antonia Danielson, its present owners, lists only the stone-enclosed burial ground. The little burial ground on the crest of a slope overlooking the Dunes Highway, includes a small plot walled in by stone and surmounted by a tall cross -- the resting place of Joseph Bailly and members of his family. There are others buried there in the three acres surrounding the area with its weather-beaten stone, but there are no tombstones over their graves, evidence of which caused the court to rule the Danielson's [Sic] were "innocent purchasers" in refusing the injunction pleas. The Danielsons, however, have kept the premises outside the Bailly plot in fine condition, despite the allegations made the desecration of wholesale character were being perpetrated. For eleven years Joseph Bailly, who came to Porter county in 1822, was the only white settler in Porter county. In his trading relations he built up a close friendship with the Indiana tribes and married the daughter of an Indian chieftan [Sic]. His old homestead, with its various buildings, in Old Baillytown, south of the Dunes highway, still remain, and are being perpetuated as a pioneer settlement by the Sisters of Providence, of Notre Dame, Milwaukee, Wisconsin. From a historical perspective, it has been well documented that Frances Rose Howe's attitude and behavior toward local residents was quite condescending and not harmonious, which may have partly been due to an outcome associated with the Bailly Cemetery's use by individuals outside her family. Interestingly, despite the Bailly family's historical significance to Northwest Indiana, there are only very brief mentions of the Bailly and Howe families published in The Chesterton Tribune during the late 1800s and early 1900s. These news items overwhelmingly paint the family in a negative light, being rather obtuse, and essentially ignored by local residents. The owners of the estate have not been unmindful of the resting place of these sons of the forest, and have marked the graves of some of those who have gone to the happy hunting grounds. It is said that Bayee [Joseph Bailly] and John Whistler and wife's remains are there, and others who were staunch friends of this departed tribe, and for whom no one seems to care for the histories or the dust. Do you know a certain Dr. Herbert (or Hubert) Skinner who poses as a historian? He is too funny for any use about our family. He says ‘he has always taken the greatest in our family.’ If so why has he never called at Bailly Homestead. If I invite him, he always wants to plunge into a wilderness of the Dismal Swamp variety and come on horseback through a net work of Indian trails. Despite Frances R. Howe’s perception and general disregard for the historian, Skinner was likely to have been keenly aware of the historical developments of Porter County and an able writer of them. The first published comprehensive history of Porter County was written by Skinner. Mention of Skinner’s 1878 history of the county is made in the 1912 History of Porter County, Indiana, where it is written that although the Skinner history is a “small work,” it “shows much careful research and investigation.” The 1912 history contains numerous passages that were essentially lifted directly from Skinner's work. In 1910, Porter County levied a tax of $15,447 against Frances R. Howe, alleging that she was hiding approximately $100,000 in assets from tax assessment. Howe obtained a temporary injunction against the county's collection of the tax. In 1913, the case came to a head. ...flung up her hands, threw back her head and screamed hysterically. All the occupants of the room, including Stephen Corby and Harriet Cross, court reporters, fled, except F. H. Wurzer, of this city [South Bend]. The examination was thus abruptly ended. Therefore I beg the people of Westchester township to desist from blindly opposing my efforts to arrange my affairs in proper shape, and I'd like to add a bit of advice frequently heard on the Pacific Coast, "Don't holler before you are hit." The origin of the affair [alleged tax evasion case] comes from the superstition of the Irish and Scandinavian peasantry, who firmly believe that the presence of fireflies in any locality indicates buried treasure. In a meadow east of our old family home in Westchester township in Porter county, there seems to be something peculiarly attractive to fireflies; they swarm there by the hundreds, not to say thousands. Our old Swedish neighbors believed, of course that much treasure lay hidden there. When they discovered that the superstitious part of their statements about this buried treasure met with ridicule they suppressed that part of their tale, but said that they knew treasure lay hidden in that meadow. Such statements passing from mouth to mouth get varied. After a few years the scene of action was transferred by neighborhood gossip to the Chicago board of trade, and from there to Wall street, and it was declared that I rivaled the Goulds and Vanderbilts in financial transactions of every description. Howe was successful in securing a change in venue for her tax case to St. Joseph County, her attorney arguing that it would be impossible for her to receive a fair trial in Porter County due to the overwhelming prejudice against her. It was immediately after this case was resolved that Howe began the process of banning visitors at the Bailly Cemetery and hired Theodore Stephens to redesign the grounds and fill in that portion of the walled cemetery with six feet of sand. It is worthwhile to note that while Frances R. Howe was a granddaughter of one of Porter County’s most prominent settlers, it is estimated that she spent far less than one-quarter of her life in Porter County. Her family resided in Chicago during her youth, where her father was a prominent banker. 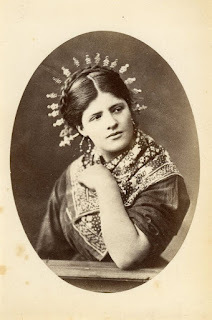 Frances also traveled extensively for long periods of time; for instance, she toured Europe and the Holy Land with her mother, Rose, and sister, Rose F., during her youth for five consecutive years. Frances also maintained a winter residence in Hot Springs, Garland County, Arkansas. ... old antagonisms toward the Bailly family by old settlers is gradually dying out, as the old timers drop off, one by one. Perhaps the present generation will encourage a history of the old [Bailly] family, without letting minor irritations of pioneer days influence their thinking. Of course there is no doubt that the Baillys did assume an upper bracket status in the early days, but that is a part of history, not an excuse to bury the memory of Porter county's first settler, who came here with his family in 1822. ... She has been away from her Baillytown home for a long time. She had built her own chapel, in which she worshiped, and her home was so private that few of the neighborhood ever saw its interior. Frances had passed away at the Clark Hotel in Los Angeles, Los Angeles County, California, while visiting her adopted daughter, Emma. Approximately one year after her death, Frances' remains were transported back to Porter County and a funeral took place at St. Patrick Church in Chesterton on January 30, 1918. The weather that day was terrible; after the funeral Mass, Frances' body was hauled by bobsled during a blizzard to Bailly Cemetery. Due to the inclement weather, it is believed that only the pallbearers and the priest were present at Frances' burial - the last burial to take place at the cemetery. Emma C. (Bachmann) Huston, Frances' adopted daughter, inherited about $3 million from Frances' estate, which included extremely valuable real estate in downtown Chicago. Emma and her first husband, James Lee Huston, were granted a divorce on June 1, 1920, in Los Angeles County, California; James was barred from associating with his two children resulting from his marriage to Emma. 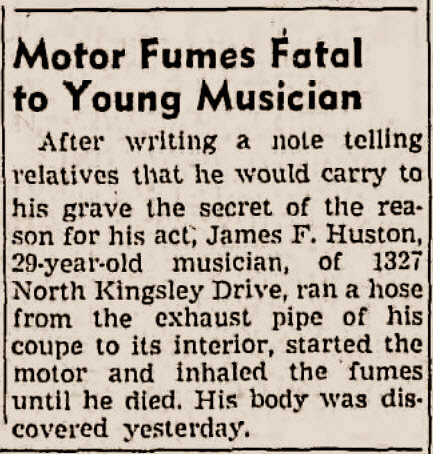 There son, James Francis Huston, committed suicide in Los Angeles on March 16, 1937. Huston, son of Emma (Bachmann) Huston. Source: The Los Angeles Times, March 17, 1937. Emma later married a man named John W. Price, and they reportedly spent all of Emma's inheritance. When Emma later divorced John, she cleaned houses and cooked for a family to earn an income. She died poor in 1963 and was buried without a tombstone marking her grave. July 8, 1834: Jacob Stair purchases land via government land patent. February 15, 1839: Jacob Stair deeds land to Therese de la Vigne, Joseph Bailly's stepdaughter, after de la Vigne pays delinquent taxes on the property. 1856: Joel Wicker, Joseph Bailly's son-in-law, acquires title to the property. Wicker owned and operated a sawmill less than one-quarter mile northeast of the cemetery. March 1864: Rosene Marie Victoire (Bailly) Howe, daughter of Joseph Bailly, acquires title to the property. 1891: Frances Rose Howe, granddaughter of Joseph Bailly, acquires title to the property upon her mother's death. 1917: Emma (Bachmann) Huston, adopted daughter of Frances Rose Howe, and Emma's husband, James Huston, acquire title of the property upon Frances' death. 1921: Carl and Antonia (Zohner) Danielson purchases the property upon James and Emma (Bachmann) Huston. 1949: Carl and Antonia (Zohner) Danielson deed the property to the Michigan City Historical Society. 1971: United States government acquires title to the property. 1900 when Emma was traveling with Frances on a tour of Italy. It should be noted that the chain of title for the land upon which the Bailly Cemetery is situated differs from that of the Bailly Homestead. circa 1908, prior to the interior being filled with sand. Information below concerning burials in Bailly Cemetery is quite fragmented and very likely to be incomplete and incorrect. The burial information provided here originates from a variety of sources, including local newspapers, the National Park Service, published records of the Northwest Indiana Genealogical Society, among others. The following burials are confirmed from a variety of source material, as well the presence of tombstones located within the cemetery grounds. Note: Son of Michel Bailly de Messein and Geneviève Aubert de Gaspé; tombstone located on south wall of 20-foot by 20-foot elevated area. Frances R. Howe provides details concerning her grandfather's burial. She indicates that family members and any other Catholics were not to attend his burial at the cemetery. Jacob Beck, a Methodist minister, was to prepare his body for burial and to lay it to rest in the cemetery. When Bailly died, Beck arrived with a homemade casket and Bailly's remains were laid into it. The coffin was then lifted to a Beck's wagon and conveyed to the burial ground. A large number of neighbors reportedly attended the funeral service at the cemetery and "Friendly hands heaped the beautiful yellow sand into the grave...."
Note: Aged 83y; tombstone located on south wall of 20-foot by 20-foot elevated area; when Marie (LaFevre) Bailly died on September 15, 1866, Mrs. Emma Persson prepared her body for burial while Emma's husband, Carl Persson, drove the ox-cart which brought Marie's remains to "Bailly Hill" where she was laid to rest by the side of her husband. 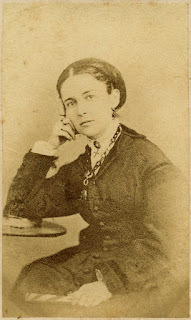 Frances R. Howe, Maries' granddaughter, wrote the following concerning Maries' death and burial: "Early in the March of 1866, she met with a slight accident while returning from a characteristic errand of mercy and charity. She slipped in crossing the lawn, not noticing a thin sheet of ice lying in the path, she fell in a manner as to jar her spine; being too old for the forces of nature to rally, this was her death blow. The annual Mass at the Homestead was delayed that year, in hopes that Grandmother would regain sufficient strength to be present, but she never did. She received all the last rites of the church in the same room, in which her husband breathed his last in the peace of the Lord passing all understanding, she slept in Christ, the 15th day of September, 1866, and the delayed Mass was said as her Requiem. The funeral was as devoid of pomp, as her husband's had been, for such was her wish, and the few Catholics present at her burial, chiefly persons of the laboring classes, were too ignorant to appreciate the holiness of her life, but they humbly accepted their pastor's declaration that they were assisting at the funeral of a great Saint." Note: According to Margaret Larson, who lived at the Bailly Homestead during the early 1900s, Frank Leonard Chellberg was buried outside the walled portion of the Bailly Cemetery. Larson reported that Frank's parents, Charles L. and Mina (Peterson) Chellberg, obtained permission from Bailly family member to inter their son at the cemetery. The Chellberg family owned real estate adjacent to the Bailly Homestead. Frank L. Chellberg's death certificate indicated that he was interred at "Baillytown." A short death notice appears in the January 30, 1903, issue of The Chesterton Tribune: "Frank L., the four months old son of Mr. and Mrs. C. L. Chellberg, of Baillytown, died last Saturday. The funeral was held Wednesday from the Swedish Lutheran church." Note: Antonia (Zohner) Danielson's remains were cremated and interred at Bailly Cemetery. Antonia and her husband, Carl, once owned the real estate embracing the cemetery. Note: Carl Danielson's remains were cremated at Mount Hope Cemetery in Chicago, Cook County, Illinois, and interred at Bailly Cemetery. Carl and his wife, Antonia, once owned the real estate embracing the cemetery. Note: Civil War veteran; burial mentioned in report prepared by C. W. Nelson in 1949. Note: Daughter of Francis Howe and Rose (Bailly) Howe; never married, but did adopt Emma Cecilia Bachmann in Chicago, Illinois, on September 26, 1904, when Emma was 23 years old. Died at the home of Emma Cecilia (Bachmann) Huston located in Los Angeles, Los Angeles County, California, on January 20, 1917. Note: Daughter of Joseph Bailly; wife of Francis Howe; tombstone located on south wall of 20-foot by 20-foot elevated area. Note: Aged 3m, 15d; daughter of Mr. and Mrs. Otto Hult; burial mentioned in report prepared by C. W. Nelson in 1949. Otto Holt, Florinda's father, obtained permission from Joel Wicker to bury Florinda's remains at the Bailly Cemetery. Note: Aged 5y; son of Mr. and Mrs. Otto Hult; burial mentioned in report prepared by C. W. Nelson in 1949. Note: Daughter of William Lundeen; burial mentioned in manuscript prepared by Theodore Stephens and published in 1956: "While I was working outside the north wall, Mr. William Lundeen, who was standing nearby, pointed to a grave near the foot of the stairs and said it was his little girl's grave, a young child of three or four years. I didn't say anything at the time but later, I had the men tear up the weeds, put a concrete low wall around the little plot and stood the tombstones up straight in cement bases. He later said he was very glad I made it so nice but the stone is now broken." Note: Obituary published in January 1, 1885, issue of The Tribune [Chesterton], states that "He [Frederick] has a fine family vault in the Baillytown cemetery, value about $1,000. . . . the remains of Frederick Michael were laid in the family vault at the Bailly cemetery." The burial location may be in error or Frederick Michaels remains may have been disinterred from Bailly Cemetery and reburied at nearby Augsburg Cemetery. Note: Wife of Samuel Constans Norten, who is interred at Pine Lake Cemetery in LaPorte, LaPorte County, Indiana. The Porter County death record for Augusta Norten indicates that she was interred at "Baillytown." Note: A burial is shown for "Ida Peterson's Brother's grave" on Theodore Stephens' map at beginning of the concrete walkway located at the rear of the walled portion of Bailly Cemetery. Note: Burial mentioned in report prepared by C. W. Nelson in 1949 as follows: "It is the resting place of Mrs. Carl Samuelson, who was the sister of Mrs. Emma Persson or Peterson, as she was later known. This Mrs. Peterson used to visit her sister's grave as long as she was able. The spot is marked by a bed of graveyard myrtle." Note: Burial mentioned in report prepared by Theodore Stephens in 1956. The Stephens family resided at the intersection of Waverly Road and Oak Hill Road, very near the Bailly Homestead. Note: A letter written by Dr. Irma Stephens and published in the January 13, 1949, edition of the Chesterton Tribune states: "My father's mother, Margaret Cissna Stephens is buried there [Bailly Cemetery] and we frequently visited the place. I understand the cemetery was largely a burial ground for French and Indian settlers...." The Stephens family resided at the intersection of Waverly Road and Oak Hill Road, very near the Bailly Homestead. Note: Taylor's burial is mentioned in a newspaper article concerning a manuscript prepared by historian Thomas Harvey Cannon. The article reads in part: "Among the many manuscripts that he [Cannon] left was one on Portage township, in Porter county, entitled 'The Recollections of Darius Blake,' dated 1929. He quoted Blake as saying: 'There was only one instance of early day Indians being suspected of poisoning the incoming settlers,' said my grandfather Jacob Blake. He recollected a man named Edgar Taylor told incoming home-seekers that he and his wife had been poisoned by having been given 'doctored' fish by an Indian pretending friendship. The wife died, and was buried in the outer area of the Bailly cemetery - and Taylor abandoned his almost completed log cabin, and returned East. On Oct. 22, 1833, Jacob Blake and his family arrived at the empty cabin. Tired out, and seeking shelter, they moved in. From nearby Indians encamped at Bailly's Landing they learned that the builder had abandoned it, and the land. So Jacob Blake took possession, and went to the Government Land Office at Winamac to perfect his title." Note: A death notice published in the May 22, 1891, issue of The Tribune (Chesterton) details the horrific death of a three year old with the surname Viedeen; the actual spelling of the surname is Veden. The death notice reads, in part: "On the day in question he ["Charles Viedeen" or Karl Johan Veden] was working for a neighbor, Mr. Chellburg, burning brush, and was assisted in the work by his wife [Christina Maria (Swanson) Veden]. Necessity compelled them to leave their children at home alone, in charge of their oldest, a girl [Alma M. (Veden) Lucker] scarcely nine years. She was taking care of a babe 18 months old [Ernest Oscar Veden]; the little victim, three years old; and a little boy five years old [August Hjelmer Veden]. About 4 o'clock this little mother went to the top of the sand hill back of the house, to see if her mother was coming, and in her absence, one of the children got hold of some matches. The five year old and the three year old toddled into the woodshed, and began playing with the new toys. They got a stone and began pounding the matches to hear them crack, and as a matter of course, they ignited. The clothes of the babe took fire and were a mass of flames before the child on the hill could get back. She heard its screams, and rushed to its assistance, but being unable to do anything, ran to Smith's, a near neighbor, and gave the alarm. Mrs. Smith at once responded, but when she got there the child was dying. Someone ran to tell the parents, and when they got there the little sufferer was lying on its little bed, made of a horse blanket, and a little feed in a bag, for a pillow, gasping its last. The poor father asked the child if it were going to Heaven. "Des, papa," was its reply, and then began showing him the cruel wounds. In a few moments after Death put an end to its suffering. The fire burned great holes in the flesh from head to foot, and must have caused awful pain. On Tuesday the father went out to get a coffin. He was without a cent, and was fearful of asking for credit. He succeeded in borrowing $5 of a man who lives out there somewhere, and with it got a coffin. When a TRIBUNE reporter went out there Tuesday evening the family were all alone. The children were crying, the father and mother crazed with the calamity that had befallen them, and the little victim lay in a little hot room unwashed, and rapidly decomposing. The father said no one had done anything for him and he expected to be alone with his dead that night as he had been the night before. He told of his circumstances, not as a mendicant, but as a broken-hearted man. Neighbors were told of the situation, and Undertaker Lundberg went out early Wednesday morning and prepared the corpse for burial. The funeral was held Wednesday afternoon at three o'clock, and the remains buried in the Baillytown cemetery." The Veden family members are interred at the nearby Augsburg Lutheran Church Cemetery; it is possible that the three year old mentioned in this death notice is buried at this cemetery as well rather than at the Bailly Cemetery. Note: Williamson's burial is mentioned in a story concerning the first train to pass between Michigan City, LaPorte County, Indiana, and Chicago and the Lake Shore and Michigan Central Railway in 1855. Reportedly, Williamson was owner of Green's Tavern at Tremont, Porter County, Indiana. A Native American named Spotted Buck had entered Williamson's tavern and began helping himself to alcohol behind the bar. Angry, Williamson struck Spotted Buck in the head with a fireplace poker and the Indian dropped dead. Spotted Buck's death was soon discovered and Williamson, who was already known by the county sheriff for other misdemeanors, made an attempt to escape the area. Williamson boarded the westbound train at Tremont, but the train derailed near Baillytown. Williamson was killed by the derailment. The article reads in part: Somehow, in one of those cases of co-incidences, the train struck an ill-made bit of track at the vicinity of Baillytown. The rails spread, the train was derailed with an emphatic jerk, and the only person injured was the fugitive, Hubert Williamson, who was thrown against an obstruction and killed.... Thomas G. Lytle was the sheriff in 1855, Ruel Starr was one of the commissioners, and Sylvester Smith was the auditor. The county records of that year show a remuneration to John Lunberg for coffin and burial of a man named Williamson, killed in a train wreck at Baillytown. The burial was apparently in a cemetery at Baillytown, and a Rev. French, officiated." There are reportedly an additional twelve Bailly family interments in the cemetery, but no tombstones can be found for these burials. Note: In Frances Rose Howe's book The Story of a French Homestead in the Old Northwest (pp. 68-69), it is stated that "He [Joseph Bailly] had chosen a spot for a cemetery on a sandy knoll, about three-quarters of a mile from the house. There he had buried his son [Robert] and had raised a huge cross of oaken beams as a landmark. In front of this cross, he erected a little log building where the only opening was a rather wide door, facing the cross. This building was not a chapel, but merely a shelter for those who went to pray at the foot of the cross, as did all the household on Sundays and Holy Days." In John O. Bowers' book The Old Bailly Homestead (p. 6), it is stated that "In 1827, while attending the Carey Mission school, near Niles [Michigan], Robert Bailly, the son, then 10 years old, became sick with typhoid fever and died. His grave was the first in the family cemetery, located a half a mile north of the old homestead." Julia Altrocchi, in her historical fiction book Wolves Against the Moon, writes that Robert's full name was Robert Michel Antoine Bailly. Note: Infant daughter of Francis and Rose (Bailly) Howe. This burial is enumerated in the National Park Service's Historic Structure Report, Bailly Cemetery: Historical, Architectural, and Archeological Data, Indiana Dunes National Lakeshore, Indiana, prepared by A. Berle Clemensen, Kenneth W. Bennett, and Catherine H. Blee and published in December 1976. Note: Infant son of Francis and Rose (Bailly) Howe. 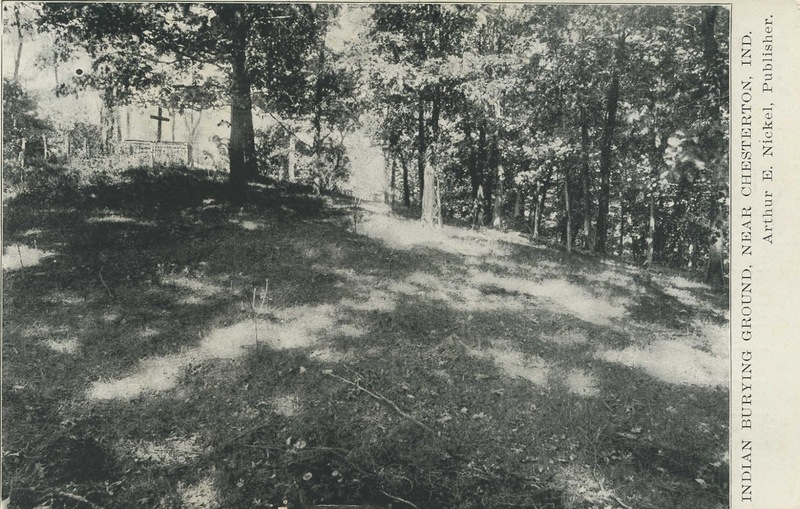 This burial is enumerated in the National Park Service's Historic Structure Report, Bailly Cemetery: Historical, Architectural, and Archeological Data, Indiana Dunes National Lakeshore, Indiana, prepared by A. Berle Clemensen, Kenneth W. Bennett, and Catherine H. Blee and published in December 1976. Note: Daughter of Francis and Rose (Bailly) Howe. This burial is enumerated in the National Park Service's Historic Structure Report, Bailly Cemetery: Historical, Architectural, and Archeological Data, Indiana Dunes National Lakeshore, Indiana, prepared by A. Berle Clemensen, Kenneth W. Bennett, and Catherine H. Blee and published in December 1976.
by Lydia J. Caldwell, Lydian Art Gallery, 103 State Street, Chicago, Illinois. Rose died soon after this photograph was taken. Note: Daughter of Marie (LeFevre de la Vigne) Bailly by her first marriage. This burial is enumerated in the National Park Service's Historic Structure Report, Bailly Cemetery: Historical, Architectural, and Archeological Data, Indiana Dunes National Lakeshore, Indiana, prepared by A. Berle Clemensen, Kenneth W. Bennett, and Catherine H. Blee and published in December 1976. The report states that Therese de la Vigne died in 1843, though no source is provided as evidence. However, David Frederick, a Bailly descendant, has provided ample evidence to show that Mary Therese de la Vigne was buried in Uniontown Cemetery located in Willard, Shawnee County, Kansas. He reports the following: "She [Mary Therese de la Vigne] used several names in her lifetime. Her birth name was Mary Therese Lavigne, her Pottawatomie name was Terrez. In her early years, she most often used the name Therese Bailly. Contrary to her portrayal in Francis Howe's book and other accounts, she attended Carey Mission longer than any of the other Bailly children and was an outstanding scholar. At the mission, she was given the name Martha Shields. She attended Worthington College in Ohio. In 1830, she married Peter Nadeau, with her mother Marie Bailly serving as witness. The name given for the marriage record was Mary Rousseau. She and her husband took over Joseph Bailly's trading concession with the Nottawasseppe Pottawatomie village near current Mendon, St. Joseph County, Michigan. They had two sons and two daughters. A notarized affidavit by her son Eli G. Nadeau is in the collection of the Oklahoma State Historical Society which asserts that the small Nadeau children spent a great deal of time with their grandmother at the Bailly homestead. She and her husband sold their Michigan land in 1836 and returned to Indiana. Mary Therese was a full member of the Pottawatomie of the Prairie tribe, and accompanied, or was part of, the "Trail of Death" forced march from Indiana to Kansas in 1839. She traded with the Pottawatomie in association with her brother-in-law John H. Whistler and his brother-in-law Robert A. Kinzie (his sister's husband). She was already living at the town site of Uniontown, Shawnee County, Kansas when the town sprung up in the 1840's. The town faded rapidly, but she remained; dying on December 17, 1867. Her daughter Mary L. Bourassa, three grandchildren, and her daughter's stepson are also buried in Willard Cemetery." Note: There is no known tombstone to exist for Mary Esther (Bailly) Whistler in the Bailly Cemetery. In a book published by her niece Frances Rose Howe titled The Story of a French Homestead in the Old Northwest (p. 148), it is stated that "I remember that Aunt Hortense died when I was about five years old, and that her remains were brought here [Baillytown] from Chicago, to be laid beside Aunt Esther." However, it is believed by Bailly family descendants that Aunt Hortense was buried in Chicago, Illinois, which would suggest that Mary Esther (Bailly) Whistler was also buried in Chicago. In the same book mentioned above, it is stated (pp. 136-137) that "The next time she [Rosene Marie Victoire (Bailly) Howe] entered her old home, just a few months later, it was to see her dear sister Esther laid in a grave at the foot of the old oak cross. Uncle Whistler was wild with grief and could not endure to remain, where everything reminded him of his bereavement. He had a good opportunity of beginning life anew in Kansas, and taking his four boys with him, went there, severing himself entirely from all that could recall to mind the days of a vanished happiness." The February 9, 1842, edition of the Chicago Daily American newspaper includes the following death notice for Mary Esther Whistler: "Died, at Baillytown, Porter Co, Ia., on the 29th ult. Mrs. Mary Esther, wife of Mr. John H. Whistler of that place, aged thirty years, six months and two days. She has left an affectionate husband, and an interesting family of five young children. She died of internal hemorrhage soon after giving birth to a healthy son. Medical aid was sent for in due time, but did not arrive until a few minutes after her decease." Note: There is no known tombstone to exist for Josephine Hortense (Bailly) Wicker in the Bailly Cemetery. In a book published by her niece Frances Rose Howe The Story of a French Homestead in the Old Northwest (p. 148), it is stated that "I remember that Aunt Hortense died when I was about five years old, and that her remains were brought here [Baillytown] from Chicago, to be laid beside Aunt Esther." However, it is believed by Bailly family descendants that Aunt Hortense was buried in Chicago, Illinois. Note: Two nephews of Francis and Rose (Bailly) Howe. These two burials are enumerated in the National Park Service's Historic Structure Report, Bailly Cemetery: Historical, Architectural, and Archeological Data, Indiana Dunes National Lakeshore, Indiana, prepared by A. Berle Clemensen, Kenneth W. Bennett, and Catherine H. Blee and published in December 1976. The 1876 plat map of Porter County indicates that Henry R. McDonald owned at least 900 acres of land in the Furnessville area of Westchester Township. Henry married Martha (Wilson) McDonald in 1830 and settled in the Furnessville area around 1832. Henry and Martha were the parents of Charles, Martha, Fanny, Lynn, Abbie, Henry, Mary, Sidney, and Elixa. The tombstone for Eliza and Sidney were discovered on the back of the McDonald farm and reportedly removed to Bailly Cemetery. Note: Aged 9y; daughter of Henry and Martha McDonald. Note: Son of Henry and Martha McDonald. The following tombstones are reportedly in storage at the Indiana Dunes National Lakeshore warehouse at the park headquarters. It is believed that these tombstones represent individuals interred in the Bailly Cemetery. Note: Aged 43y, 3m, 9d; wife of Frank Bergstrom. Note: Bottom half of tombstone is missing. Note: Aged 67y; year of death may be 1841 or 1844. Indiana Dunes National Lakeshore headquarters. Note: Aged 61y; year of death may be 1846. Note: Aged 3y, 6m; son of J. and E. Speer. Note: Tombstone broken and pieces missing. Bowers, John O. 1922. The Old Bailly Homestead. Gary, Indiana: John O. Bowers. 13 p.
Clemenson, A. Berle, Kenneth W. Bennett, and Catherine H. Blee. 1976. Historic Structure Report, Bailly Cemetery: Historical, Architectural, and Archeological Data, Indiana Dunes National Lakeshore, Indiana. United States Department of the Interior, National Park Service, Historic Preservation Division. Denver, Colorado: United States Department of the Interior. 85 p.
Halpenny, Francess G., and Jean Hamelin (eds.). 1987. Dictionary of Canadian Biography, Volume VI, 1821 to 1835. Toronto, Canada: University of Toronto Press. 960 p.
Hoffman, Charles Ferno. 1835. A Winter in the West. By a New Yorker. Two volumes. New York, New York: Harper & Brothers. 683 p. [see pp. 224-241]. Howe, Frances R. 1881. Memoir of Rose Howe. Chicago, Illinois: Fergus Printing Company. 64 p.
Nelson, C. W. 1949. The Bailly Cemetery. Manuscript in Reed Folder, Indiana Dunes National Lakeshore Park. Pfanz, Harry W., and T. Russell Jones. 1972. Historic Structure Report, Bailly Homestead, Historical and Architectural Data, Indiana Dunes National Lakeshore, Indiana. United States Department of the Interior, National Park Service, Historic Preservation Division. Denver, Colorado: United States Department of the Interior. Schoon, Kenneth J. 2013. Dreams of Duneland: A Pictorial History of the Indiana Dunes Region. Bloomington, Indiana: Quarry Books. 286 p. [see pp. 140-143]. Sullivan, James R. 1958. Historic Site Survey: The Bailly Homestead, Porter County, Indiana. Philadelphia, Pennsylvania: United States Department of the Interior, National Park Service, Region Five. 40 p.
United States Atomic Energy Commission, Directorate of Licensing. 1973. Final Environmental Impact Statement Related to Construction of Bailly Generating Station Nuclear-1, Northern Indiana Public Service Corporation. Docket No. 50-367. Washington, D.C.: United States Atomic Energy Commission. 332 p.
Schiemann, Olga Mae. 1955. From a Bailly Point of View. Duneland Historical Society 1(5):1-95. Stephens, Theodore. 1956. Bailly Cemetery - Roman Style. Duneland Historical Society 2(4):1-6. The Tribune, Chesterton, Porter County, Indiana; January 1, 1885; Volume 1, Number 40, Page 1, Column 2. Column titled "Obituary. Died, on Tuesday, December 23rd, 1884, at His Residence at Porter Station, Frederick Michael, of Heart Disease, at the Age of 55 Years." The Tribune, Chesterton, Porter County, Indiana; May 22, 1891; Volume 8, Number 6, Page 1, Column 2. Column titled "Burned to Death." The Chesterton Tribune, Chesterton, Porter County, Indiana; February 7, 1902; Volume 18, Number 44, Page 5, Column 4. Column titled "Chesterton Chips." The Chesterton Tribune, Chesterton, Porter County, Indiana; January 30, 1903; Volume 19, Number 43, Page 5, Column 6. Column titled "Porter Pointers." The Chesterton Tribune, Chesterton, Porter County, Indiana; August 24, 1905; Volume 22, Number 21, Page 1, Column 6. Column titled "Miss Howe Airs Her Woes. Thinks Her Example of Culture, Refinement, Virtue and Intelligence is Not Properly Appreciated. Indignantly Resents the Statement that She is 'An Indian.'" The Chesterton Tribune, Chesterton, Porter County, Indiana; October 7, 1909; Volume 26, Number 28, Page 8, Columns 1-3. Column titled "Effaced Footprints on the Sands of Time," by France R. Howe. The Chesterton Tribune, Chesterton, Porter County, Indiana; June 12, 1913; Volume 30, Number 12, Page 1, Column 2. Column titled "A Historic Spot. Remains of Early French Days Attract Considerable Attention." The Chesterton Tribune, Chesterton, Porter County, Indiana; July 10, 1913; Volume 30, Number 16, Page 4, Column 3. Column titled "Miss Howe Cards the People." The Chesterton Tribune, Chesterton, Porter County, Indiana; July 10, 1913; Volume 30, Number 16, Page 6, Column 3. Column titled "Woman Screams; Others Flee." South Bend News-Times, South Bend, St. Joseph County, Indiana; July 12, 1913; Volume 30, Number 196, Page 1, Column 5. Column titled "Dress Criticism Caused Hysterics." South Bend News-Times, South Bend, St. Joseph County, Indiana; July 23, 1913; Volume 30, Number 207, Page 1, Column 6. Column titled "Fire Flies Started Story of Buried Treasure She Says." The Chesterton Tribune, Chesterton, Porter County, Indiana; July 31, 1913; Volume 30, Number 19, Page 1, Columns 4-5. Column titled "Hidden Treasure is a Myth. Miss Howe Says the Fireflies are to Blame for Sequestered Taxes. Far Fetched Story Going Rounds of the Press Regarding the Origin of the Suit to Collect Back Taxes From Her." The Porter County Vidette, Valparaiso, Porter County, Indiana; January 24, 1917; Page 5, Column 1. Column titled "Miss Howe is Called by Death." The Chesterton Tribune, Chesterton, Porter County, Indiana; January 25, 1917; Volume 33, Number 45, Page 1, Column 6. Column titled "Frances Howe Passes Away. Succumbs to Disease at the Home of Her Adopted Daughter, Mrs. Houston, in Los Angeles." The Porter County Vidette, Valparaiso, Porter County, Indiana; February 7, 1917; Page 2, Column 3. Column titled "Body of Miss Frances Howe Coming in Two Weeks." The Porter County, Vidette, Valparaiso, Porter County, Indiana; February 21, 1917; Page 6, Column 5. Column titled "Local Squibbs and Personals." The Los Angeles Times, Los Angeles, Los Angeles County, California; December 9, 1919, Volume 29, Number 9, Part II, Page 1, Columns 4-7. Column titled "Award Heiress Children, Home. Adopted Daughter of Frances Howe Bests Husband." The Los Angeles Times, Los Angeles, Los Angeles County, California; June 2, 1920, Volume 29, Number 183, Part II, Page 21, Columns 1-3. Column titled "Heiress Wins Divorce Fight." The Vidette-Messenger, Valparaiso, Porter County, Indiana; August 16, 1927; Volume 1, Page 1, Columns 7-8 and Page 2, Column 3. Column titled "A Three Acre Plot, Porter County's Oldest Burial Spot Cause of Bitter Court Action," by Englebert Zimmerman. The Chesterton Tribune, Chesterton, Porter County, Indiana; August 18, 1927; Volume 44, Number 23, Page 1, Column 4. Column titled "Suit Filed to Prevent Closing Howe Cemetery." The Vidette-Messenger, Valparaiso, Porter County, Indiana; August 24, 1927; Volume 1, Page 1, Column 3 and Page 3, Column 3. Column titled "Court Balks on Issuing Outer Writs." The Chesterton Tribune, Chesterton, Porter County, Indiana; September 1, 1927; Volume 44, Number 25, Page 5, Column 4. Column titled "Local - Social - Personal." Boyden Reporter, Boyden, Sioux County, Iowa; September 29, 1927; Volume 35, Number 39, Page 2, Column 1-2. Column titled "Battle on Over an Old Cemetery." The Vidette-Messenger, Valparaiso, Porter County, Indiana; November 11, 1927; Volume 1, Page 1, Column 1. Column titled "Court Ruling Ends Historic Cemetery Suit." The Chesterton Tribune, Chesterton, Porter County, Indiana; November 17, 1927; Volume 44, Number 36, Page 1, Column 4. Column titled "Court Ruling Ends Howe Cemetery Suit." The Los Angeles Times, Los Angeles, Los Angeles County, California; March 17, 1937; Volume 56, Number 104, Part II, Page 17, Column 4. 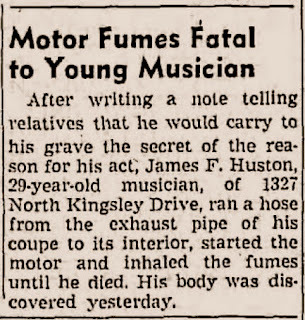 Column titled "Motor Fumes Fatal to Young Musician." The Chesterton Tribune, Chesterton, Porter County, Indiana; December 26, 1929; Volume 46, Number 42, Page 6, Columns 3-4. "Column titled " Bailly of Colomique. Site in Porter County Recalls Struggles of Pioneer in Northwestern Indiana." The Vidette-Messenger, Valparaiso, Porter County, Indiana; February 8, 1949; Volume 22, Number 183, Page 1, Columns 1-2. Column titled "County Landmark is Bought by Michigan City Society." The Vidette-Messenger, Valparaiso, Porter County, Indiana; December 28, 1957; Volume 31, Number 149, Page 2, Column 7. Column titled "Gathers Material On Joseph Bailly, Pioneer Settler." The Vidette-Messenger, Valparaiso, Porter County, Indiana; October 16, 1958; Volume 32, Number 87, Page 1, Column 1 and Page 6, Column 5. Column titled "Manuscript Tells of Portage." The Vidette-Messenger, Valparaiso, Porter County, Indiana; July 29, 1972; Volume 46, Number 22, Section II, Page 14, Column 1-4. Column titled "Rollie Barnhart's Somebody, Or Something."